For full spectrum super-anti-oxidant power. This is a sugar less and ghee free version of Maharishi Amrit Nectar paste. If you have a sugar intolerance, try this MA4 Nectar Tablet (Also Known as MA7) as an alternative to the traditional MA4 Nectar Paste formula. It contains the same ingredients listed for the Nectar Paste less nearly all of the sugar. Contains no clarified butter or honey. Formulated especially to improve natural immunity and clear the energy pathways of the physiology. Amrit tablets (MA4) are especially good for the mind, brain and nerves. Also promotes vitality and inner strength. All-natural, pesticide-free blend of 13 traditional herbs. Amrit Kalash is a combi-pack of 60 Nectar Tablets and 60 Herbal tablets (Ambrosia) - MA4 and MA5. The Nectar tablets and Ambrosia herbal tablets work together to create overall health. They contain different ingredients but have complementary effects. This ancient Ayurvedic herbal supplement is known to provide balance and strength to body’s immune system by protecting the body against free radical damage. Ayurvedic experts say that Amrit Kalash contributes to the state of bala — a state where the body’s own ability to defend itself is at its optimum. Rasayana means "that which supports Rasa." Rasa corresponds to plasma and nourishes the whole body. Where single herbs can be dangerous, Rasayanas are complex combinations that include natural antidotes and herbs that are "best friends." The result is a synergistic combination (Amrit Kalash) much more powerful than the sum of the effects of the individual herbs. The latest research shows that one gram of Amrit kalash is more effective against free radicals than 1,000 grams of vitamin C or E. It takes 250 meticulous steps to prepare. Amrit Kalash is an Ayurvedic Herbal Masterpiece and a true gift to the world! 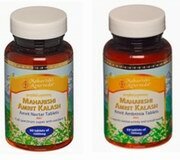 One bottle of MA4 (60 Tablets) and one bottle MA5 (60 Tablets) comprising 1 months supply of Maharishi Amrit Kalash.